Apparently belting outerwear (i.e. vests, blazers, coats) is a major trend now, and I LOVE IT. I feel like most outerwear is relatively shapeless, which does nothing for my figure. That’s probably why I love trench coats and my new Ted Baker coat so much – adding a belt immediately cinches your waist and draws attention to the narrowest part of your body. So, if your vest/blazer/coat doesn’t already come with a belt, why not just plop your favorite one over it? I’m obsessing over this trend! I just need to add a few more belts to my arsenal so I have more options. I recently picked up this chain belt on sale and have been using it so much already! The heavy gold chain really pops and adds an extra punch of glam to whatever I’m wearing. To dress down my favorite Cynthia Rowley number for daytime, I just paired it with my current go-to boots and an oldie-but-goodie fur vest. Adding the belt made the look though! I definitely recommend testing out this trend – it’s super easy to do with items you already own! Since we’re talking fur today, I wanted to mention a few great sale finds for those of you who like to stock up on this luxe look at a discount – and really, who doesn’t? If bright colors are your jam, you’ll obsess over this orchid-hued Adrienne Landau vest. A lighter and more subtle option is this mauve fox fur vest by Fox Unlimited. If classics and neutrals are more your speed, check out this fur-trimmed utility jacket and this gorgeous blonde fox fur cape. Love the boots and the belted fur vest! You look stunning, Meritt! I am ALL about belting outerwear! OP does it best! I love how you layered that dress with the belt. I can’t pull off the belted outerwear but you look great with it styled that way! I need to run out and get myself a cute belt asap!! LOVE how you styled this whole look! Dying over your chic vest and your otk boots!! I love this trend and need to start belting some of my vests and coats! You look beautiful! Great vest!! And, I need that CR dress!! Such a perfect year round staple!! Love cinching anything! That vest looks so warm and love the flare on the dress! I love the belted coat / vest look. 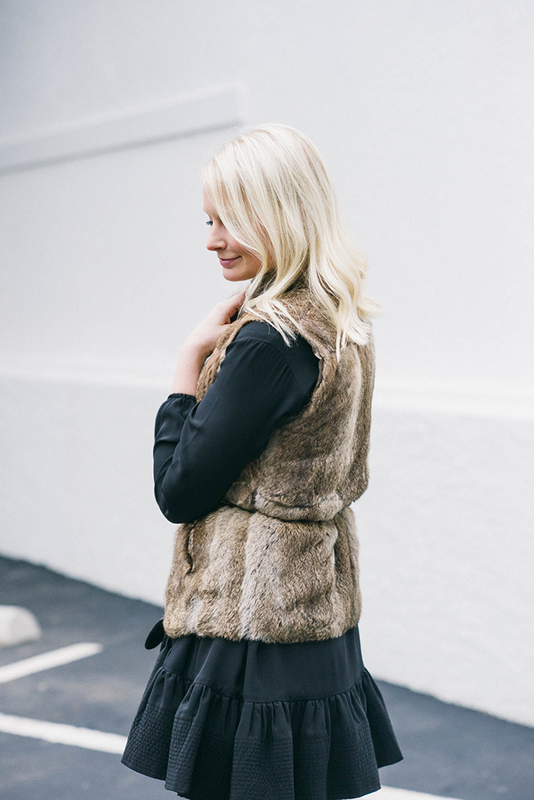 I actually tried on the Alice + Olivia fur vest that you linked to and it was soooo incredible soft. I didn’t want to leave the store without it, but I just couldn’t commit. I have to re-think it after seeing your beautiful photos! 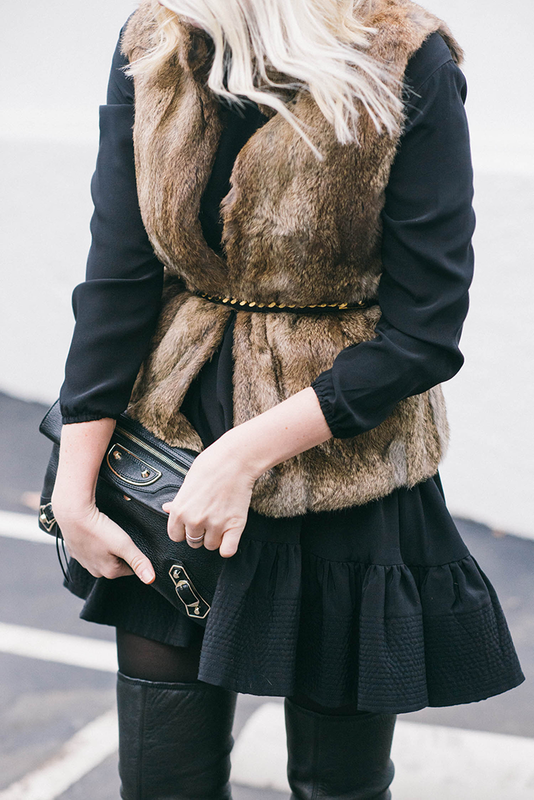 The fur vest is so dramatic against all the black. Very pretty! This is such a great look! Love how you added the belt. This makes the outfit look super polished! Love it! Such a fun look! And I love the vest! love this look and I love love that clutch. This look is everything! You’re absolutely stunning! I LOVE this, Merritt! That dress is so pretty on you and I’m having some serious bag lust! The dress and fur vest are fabulous! Looking good Merritt! Such a beautiful outfit! 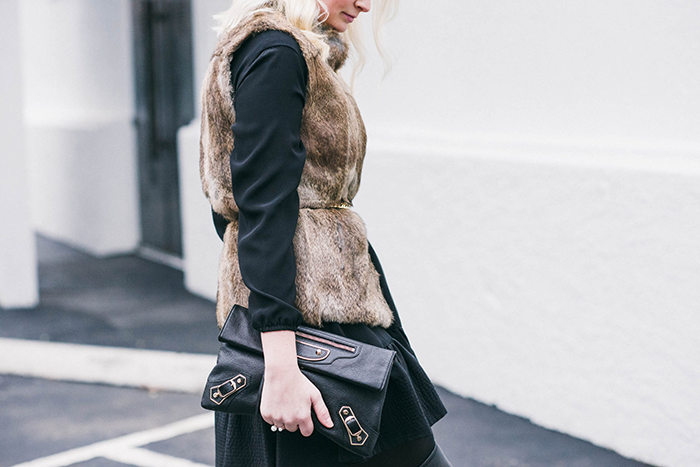 Adding a belt to your vest makes it extra chic. What a smart idea! Faux fur twins today! Now I totally need to take a que from you and style my vest this way. Pinning! totally copying this look! I love it! Beautiful look, love how you styled it!! The skirt is so nice!! Love that belted vest, Merritt! I love that you belted the vest! And those boots are amazing!